Flatland’s long history at the market belies its humble beginnings. 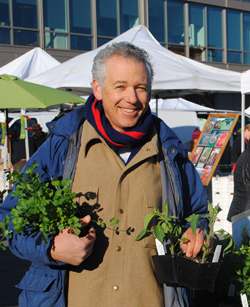 In the 1990s, while Lehrer was completing a master’s in journalism at Berkeley and Krueger was working as a magazine editor, they moonlighted as helpers at the Berkeley Farmers Market. One cold February day, they decided to bring some bunches of cut sweet peas from their backyard garden to the market, and Flatland Flower Farm was born. “The ‘farm’ part was kind of joke,” Lehrer laughs. “We’d have the organic inspector come and inspect our backyard. It was always funny.” They started selling their sweet peas and plant divisions regularly, and the business began to grow. While the two knew little about plant propagation, Krueger shadowed fellow marketeer Annabelle Lenderink of Star Route Farms to learn more about seeding. Though they’re no longer in the Berkeley flats and no longer a flower farm, the name has stuck, and Flatland now sells their starts to retail nurseries around the Bay Area. Remaining part of the farmers market community has been invaluable in helping Lehrer and Krueger find seed sources, stay on top of the popular vegetable varieties, and receive feedback on what works in what conditions. Being at the market every week also gives them the opportunity to educate and learn from their customers. “You can’t just say, ‘That’ll be $3.75’ and send people on their way, because many people don’t know how to grow stuff,” says Lehrer. The farm has also hosted school tours for CUESA’s Schoolyard to Market program, teaching San Francisco high school students about the basics of plant propagation. 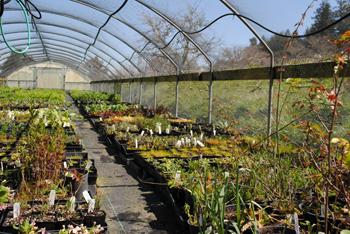 Lehrer has talked to thousands of Bay Area gardeners over the years and offers a few tips to inspire and empower beginners. Don’t be shy. When buying plant starts, expect a conversation. “I always find out people’s back story when I’m talking to them because that’s crucial to giving them a successful growing experience,” says Lehrer. He asks a lot of questions (“Where do you live? What are the conditions like? What are growing now?”) and expects you to do the same. Start small. If you’re new to gardening, try growing low-maintenance and versatile herbs like thyme and rosemary, which are perfect for containers and are only harvested a bit at a time. All you need is a sunny windowsill. Arugula and lettuce are also ideal for newbies because they grow fast and are well suited to San Francisco’s varied microclimates. Be water smart. Keep your plants hydrated and protect the soil by putting mulch, such as pebbles or bark, on top of your pots to slow down evaporation. Place saucers under your pots to catch water that can later be wicked back up by the plants. Lehrer recommends checking out The Urban Farmer Store for classes and supplies to make watering plants easier and more efficient. Get your plants starts from Flatland Flower Farm at the Saturday farmers market. 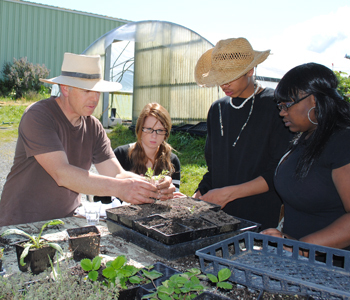 For classes and other resources for urban gardeners, visit Garden for the Environment and The San Francisco Urban Agriculture Alliance.